Get rid of weekend boredom with Osmo Detective Agency. This clever game will turn your little ones into true detectives and have them solve cases in no time! Equipped with eight maps of the world’s famous cities including Osmo Town and a magnifying glass, kids will learn about geography and landmarks around the world! Little Miss took no time at all to load up the app, grab her magnifying glass and start searching for a missing cat around Osmo Town! Osmo's clever little red gadget uses the iPad’s camera to see what steps your child is taking in the game to provide feedback. Little Miss looked through the town using her magnifying glass, searched for clues, checked out different buildings, listened to stories, watched little movies with total focus and concentration and enjoyed herself. She was so happy when she followed all the clues, solved the case and found the missing cat! She continued solving different cases through the different maps of the world. I loved showing her through the map of Paris and Beijing where I grew up and Sydney where we live now. Little Mister also had a go and loved searching across the city of Rio de Janeiro in Brazil. He loved finding soccer balls, looking at the different buildings and checking out musicians. The kids loved reviewing Osmo Detective Agency! Such a fun and entertaining game where kids can discover and learn about different cities in the world and its famous buildings, sights and people. Curious kids will love it! For more information about Osmo Detective Agency, head to their website. Osmo Detective Agency is RRP $39 (Game only not included Osmo base). Busy City Kids were asked to review Osmo Detective Agency which was gifted to us for the purpose of the review however no sponsored payment was provided. As always, our opinions and comments are our own and we only endorse businesses and products we believe in. Read more in my Disclosure Policy here. 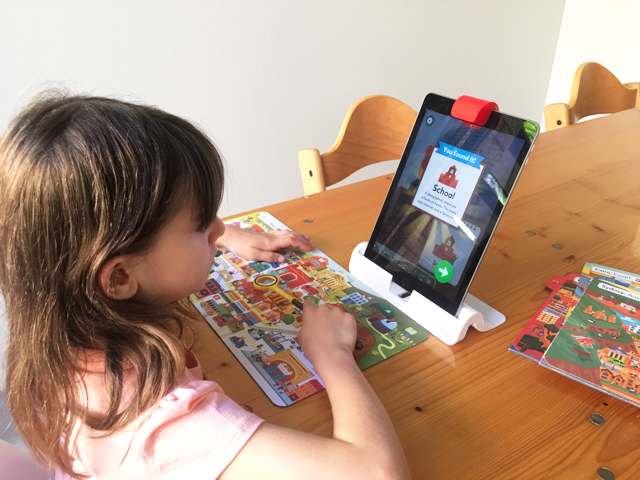 To checkout our review of Osmo Creative Kit and Coding Awbie Game, head to our website. For more Busy Tech Kids reviews of apps, products and more, head to our Busy Tech Kids page. A few weeks ago, Kate found LaQ (pronounced as La Kyuu), a very simple, yet highly creative and tactile construction toy. Its uniqueness comes from using just 7 types of block parts (2 base parts and 5 connector parts) to make an infinite possibility of creative 2D to 3D models. To build different models, all you have to do is click the different pieces together. 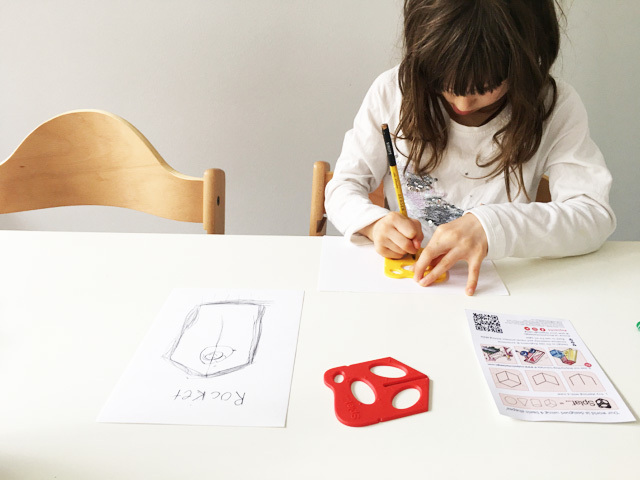 Kids can make simple to complex 3D models that will also challenge teenagers and adults alike. 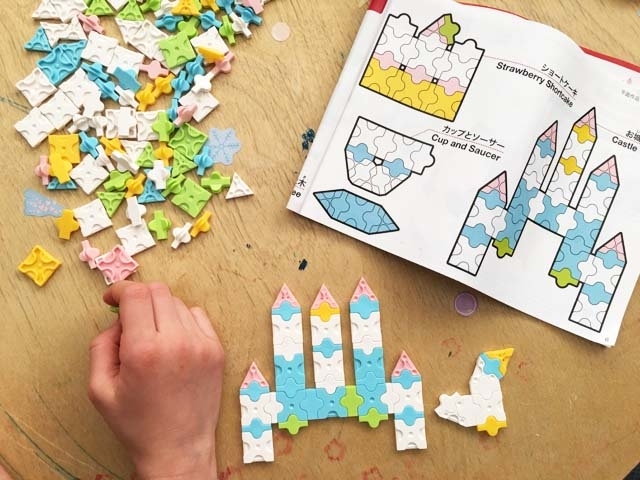 Kate’s little ones were gifted the Basic 101 Kit which includes 185 pieces. Designed for kids 4 years+. You can build 46 2D models with the set’s instruction guide using 4 flat types of LaQ parts in 10 fun colour. Kate’s kids enjoyed snapping together & clicking the LaQ parts but with a little help from Kate they were both quickly using the instruction sheets & making a variety of colourful models. Little Miss and her brother were gifted the LaQ Sweet Collection Princess Garden Set which includes 175 pieces. Designed for kids 5 years+. You can design 5 different 2D models in the instruction guide provided as well as simple designs. It was a bit tricky for little Mister to click the pieces together however he still enjoyed the idea behind the product and liked the tree and bird we made together. Little Miss on the other hand, had no issues putting together a bird, a castle, a strawberry shortcake, a horse, a tree and a flat bracelet. She is slowly getting around the idea of building a 2D horse and carriage. The kids and I really liked the LaQ Sweet Collection Princess Garden Set and will have a look at other sets that might be of interest to us for future presents. Little Miss likes making the one dimension castle, however we both gave 2D construction a go and made the first model - Flower Castle. A very cool castle, bit tricky in parts but lots of fun. I helped little Miss with selecting the parts and she was happy to put it together following the instructions. Doing the construction together was a great activity for the two of us to spend time together and great for little Miss’ fine motor skills and promotes her attention to detail and concentration. For more information about LaQ Australia products, head to their website. The kids and I were recently gifted some cool products from Osmo to test out. We were already massive fans of Osmo, having used the Genius Kit many times at our friend’s house before and recently at the recent Play World Australia event. Osmo is a clever play system that teaches kids coding, maths, language and art while they have fun. This great STEAM (Science, Technology, Engineering, Art, Maths) product is lots of fun for little and big kids from 4 to 12 years although little Mister 3 had lots of fun trying them out too. We were gifted the Osmo Creative Kit and the Coding Awbie Game. The Osmo Creative Kit comes a fuzzy pouch/eraser, six Yoobi dry-erase markers, the creative white board and the Osmo base which lets you use the Monster app with the kit along with the Masterpiece and Newton apps. The Coding Awbie Game comes with coding blocks which lets you take a cute Awbie friend on walks, jumps and lets him eat strawberries and build a world in a magical world. Little Miss first tested out Osmo Creative Kit. The Osmo base includes a little gadget which lets your iPad ‘see’ what you draw on the creative board. Kids are taken on a journey with their onscreen friend Monster. They are asked to draw a balloon as a first task and then asked if they want to go on a journey to do a magical show, draw a kitchen/bedroom and more. Instructions are quite easy to follow and even little Mister had a go at the game and loved it. The Osmo Monster app and Creative Kit are both amazing in regards to creativity but are also great for literacy. Little Miss liked following the prompts, draw what Monster asked her to draw and copying the writing on the screen. We also tested Coding Awbie Game which is an excellent game to help kids understand the concept of coding. As technology evolves everyday, experts say that by the time our children finish school, they will be exposed to technologies that don’t even exist currently. This is why the sudden push towards encouraging children towards STEAM fields (Science, Technology, Engineering, Arts and Maths). Girls especially are encouraged to participate in STEAM fields as they are outnumbered by boys. A great example is little Miss’ coding class where she is the only girl in her class. When I completed my degree in IT, we were only 3 girls in our degree and by honours year I was the only girl. I was hoping things would change in 12 years but we still need to help girls take part in those fields. Little Miss already takes coding class after school every week however she hadn’t tried the Coding Awbie Game before. It comes with easy to use coding blocks which represent coding sequences like walk straight away for 5 steps (as shown below) and a play button to execute the sequence. The kit also comes with various other sequences like run, jump and other special sequences/commands which all ‘click’ together by the use of magnets and swivel buttons. Help from the app is provided at the start and phase out to let children make their own decisions. Little Miss loved the Osmo Creative Kit and Coding Awbie Game and so did her brother even though he is 3 he still had a go and loved those games. We featured a video of little Miss using the Coding Awbie Game on Instragram which is lots of fun which can be viewed here. Having tested both products and received lots of great feedback from both kids and they haven’t stopped playing with them, we highly recommend them. Busy City Kids were asked to review these two Osmo products, these were gifted to us for the purpose of the review however no sponsored payment was provided. As always, our opinions and comments are our own and we only endorse businesses and products we believe in. Read more in my Disclosure Policy here. Since little Miss started school, I am constantly reminded of how quickly my little girl has grown and how clever she is. She gets restless if we don't go out or do something indoors. Like most kids, she has many toys that she doesn't play with and some she is now too old for. With my background in IT, I always aim to provide her with opportunities to problem solve and create and to show her possibilities in STEAM fields to help her in the future if she pleases to go into those streams. When we last visited one of the big stores for one of her friend's birthday present, she asked me for a present too. I didn't really want to buy her anything as she has enough toys however she surprised me by choosing Geomag. I'm a sucker for STEAM (Science Technology Engineering Arts and Mathematics) products and Geomag looked great so I couldn't say no. Besides toy sales were on too, try explaining that to her dad though - ha! Little Miss didn't just choose any Geomag set but chose the Geomag Glitter version of course! As soon as we got home, she started building straight away following the instructions and different models that she could build but then created her own models afterwards. This worked out well as it kept her busy for almost one hour and kept her stimulated. The Geomag Glitter pack we bought only had 30 pieces however I wish we had chosen the 68 piece to give her the opportunity to build bigger models. These sets are great at magnetic engineering. 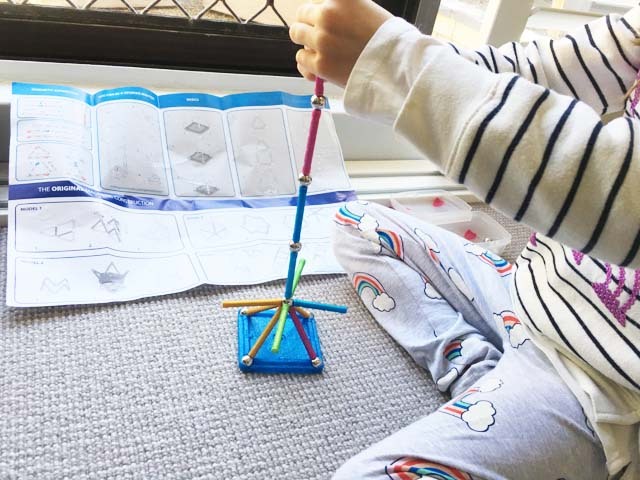 The 30 piece set contains 13 blue, red, yellow, and orange glitter magnetic rods and 16 non-magnetic steel balls to allow you to connect and build whatever awesome creations you want. It also includes 1 blue glitter square panel to get more in-depth! These Geomag Glitter STEAM sets are great at helping children of all ages develop imagination and curiosity through the science of magnetic construction. Little Miss loves building with her Geomag set so we will have to get her more connectors to build bigger! The magnets are safe for kids however they are not suitable for children under 3 because of the small magnet balls which are a choking risk. Kids 5 years+ will love Geomag Glitter. Also to bare in mind, magnets are to be kept away from sensitive devices such as credit cards, computers, magnetic media and medical devices like pacemakers. Busy City Kids were not asked to review this product and it is not sponsored in any way. The purchase was self funded. As always, our opinions and comments are our own and we only endorse businesses and products we believe in. Read more in my Disclosure Policy here. To purchase Geomag Glitter, head to our Amazon partners' link. This post contains an affiliate link. You don’t pay any extra however I earn a small commission to help pay for website hosting costs.